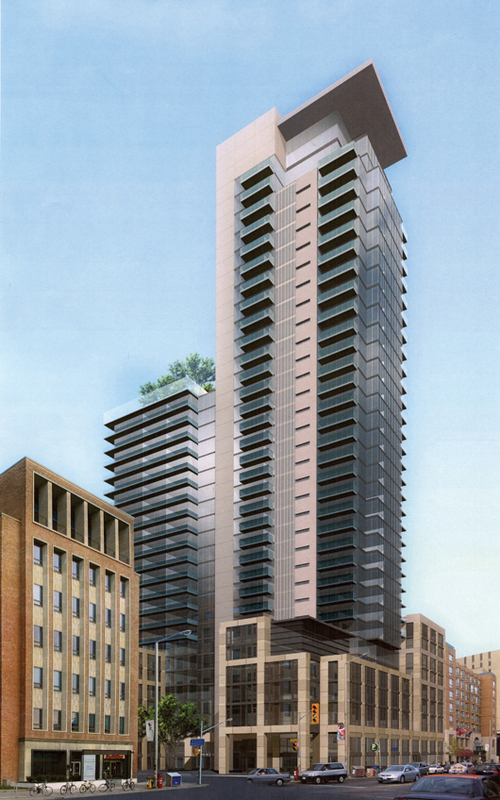 This thirty-three storey residential condominium, with retail occupancy on the ground floor, is located at the north-east corner of Bedford Road and Bloor Street in Toronto, close to the campus of the University of Toronto. It has four levels of subgrade parking with 354 vehicle parking spaces and 236 bicycle parking spaces. There are exclusive use terraces on the fifth, seventh, ninth, eleventh and thirty-first levels, with customized landscaping, from the seventh floor and above. On the second floor, there is a large common area terrace, which is enclosed on three sides by the amenities area. The walls are founded on strip footings and the columns are founded on spread footings. All footings bear on natural undisturbed soil capable of safely sustaining a pressure of 750 kilopascals (ie. 15,660 pounds or 7.83 tons per square foot). To deal with the vibrations from the Bloor Street subway tunnel, which is in close proximity to the north foundation wall, most of the columns are detailed with special 50 megapascal, reinforced concrete bases, set on vibration isolation pads in formed depressions in the footing pads or caps. 220 mm with 150 mm deep drops, to 300 mm with 150 mm deep drops over 300 mm deep capitals, to satisfy different loading criteria. The second floor framing is comprised of beams to carry shear walls above, with typically 200 mm thick one-way reinforced concrete slabs spanning between the beams. The third floor framing is similar to the second floor with one-way slabs spanning between the shear walls, except in the north-east wing where the reinforced concrete flat plate is 600 mm thick, with 350 mm deep capitals, over the columns, to transfer loads from the shear walls and columns above onto the different grid of the columns below. From the fourth floor up, the floor slabs are typically 200 mm thick one-way reinforced or flat plates spanning between shear walls or columns. To deal with the excessive shear forces that the 35 megapascal concrete, could not sustain, at some of the columns, below the terraces, four rows of paired 15M reinforcing steel stirrups, with a yield strength of 400 megapascals, were placed in the slabs at each of the four sides of the columns. Lateral forces, resulting from wind or seismic affects, are resisted by the interaction of the central core, containing three elevator shafts, mechanical shafts, and scissor stairs, with the shear walls. The specified twenty-eight days strength of the concrete in the columns and walls varies from 50 megapascals below the fourth floor, down in 5 megapascal increments to 30 megapascals above the twenty-fourth floor.